Originally founded to supply transportation to people with disabilities in York Region, the Markham Transit for the Disabled Charitable Foundation ( Markham Mobility Foundation ) expanded their definition of “transportation” to include two essential methods of “lifting” our residents. 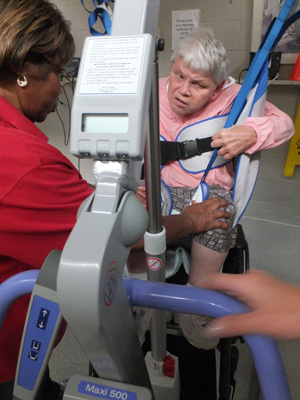 In assisting our residents with activities of daily living, our Personal Support Workers and Nursing staff use the two donated Hoyer Lifts to safely and efficiently transfer residents from bed to chair, from chair to toilet, etc. These lifts provide back-saving assistance to ensure everyone can enjoy safe transfers. At our Henderson House location, the existing ramp was in need of repair; rather than funding the repairs, our staff suggested that an indoor lift would not only ensure a safe transport from the ground into the home but also do it in the comfort of the garage! Read the article on YorkRegion.com.